Cremation urns should represent the essence of the person it holds. Too often, people choose basic cremation urns because they do not know their options. Luckily for you, there are tons of cremation urns available that unique, highlights what your loved one's interests, and also look great in any room in your home. In this post, we highlight some of our favorite Dragonfly cremation urns that can hold both human and pet ashes. However, before we highlight our favorite dragonfly cremation urns, here are our top picks for dragonfly cremation urn necklaces. This custom dragonfly urn necklace holds a precious lock of ashes or hair from a loved one or pet. 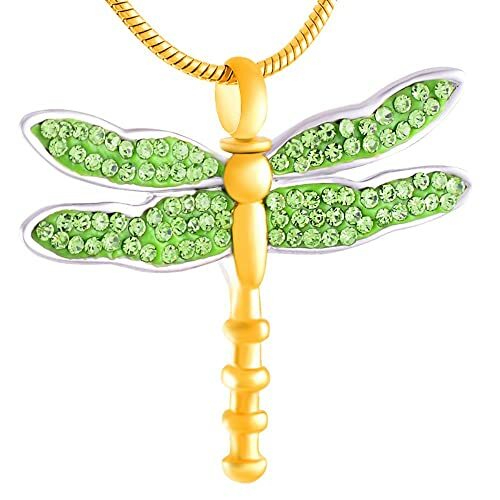 Made out of stainless steel, this urn necklace features a gold dragonfly with crystals on the wings. 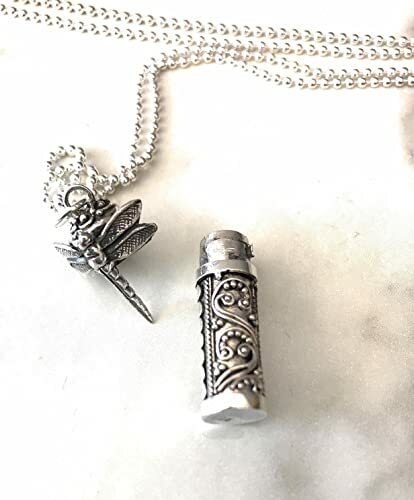 Not only does this stainless steel necklace have dragonfly that will hold a tiny amount of hair or cremation ashes, but it also features a bead stone that can hold essential oils. This cremation necklace comes in multiple colors. Green, blue, and black. Perfect to hold hair or cremation ashes. 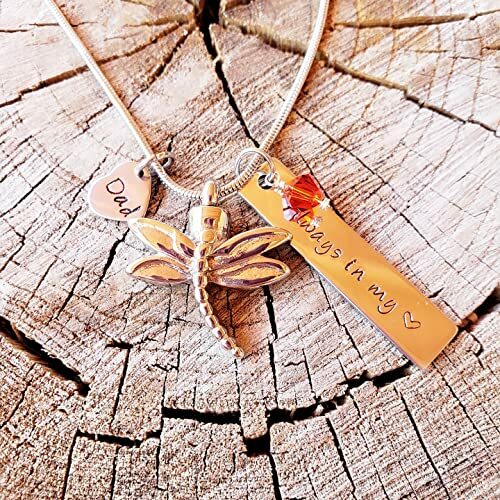 This hand stamped necklace features a dragonfly, your loved one's name, and their birthstone. 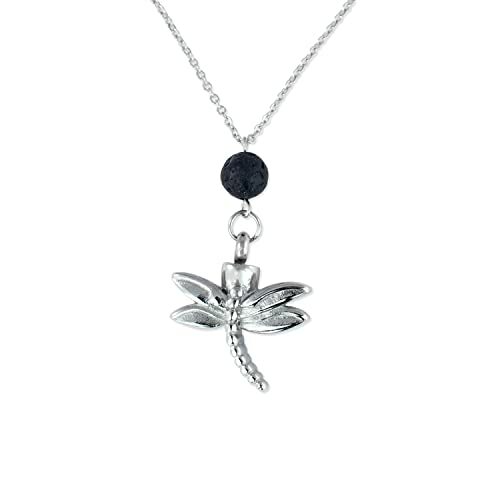 Our dragonfly urn necklace for ashes or hair is a top pick among our customers. This piece of jewelry is engravable with a couple of lines of text. Made of brass and covered with a gloss coat, this cremation urn is a bit different as it also functions as a candle holder. The handout dragonflies make this cremation urn standout. The lower portion holds the cremation ashes safety from the heat and flames. Our signature raku cremation urns are a favorite for many families. These cremation urns are handcrafted individually and have unique colors making each one unique. 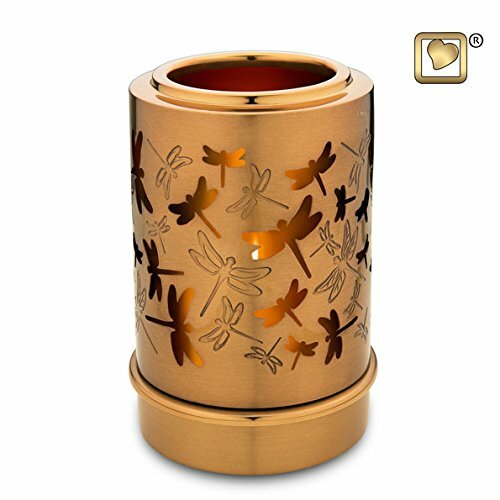 Designed to hold the full amount of human cremation urns, this dragonfly raku cremation urn will standout in your home.